Happy Pink Saturday! I have really had a good week, but it has kept me so busy that I didn't blog all week. If you follow my blog, you know that every year myself and 6 other very talented ladies make a quilt for the MCC sale in Hutchinson, KS. MCC stands for Mennonite Central Committee and they do a lot of wonderful things! They are known for helping with disaster relief and often are one of the first to arrive at the scene. This last year, we made a Valentine Crazy Quilt made from a pattern designed by Carole Samples. As I pieced the quilt, I made some changes from the original pattern but really I do love how it turned out. Our group has met the wonderful person who bought the quilt. 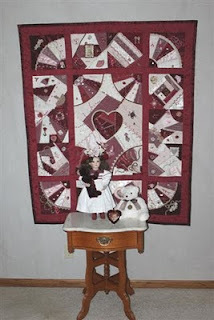 She is also a crazy quilter and we know it went to a really good home! She sent me the picture above and doesn't it just look perfect in her house! I hope you have a good Pink Saturday and remember to visit Beverly our sponsor at www.howsweetthesound.typepad.com. What a beautiful share. You ladies did such a gorgeous job on this quilt, and I would say it went to a very happy house. Does it not look beautiful in it's new place of glory? I love it. Thank you so much for sharing it with me on this glorious Saturday. Have a beautiful day. I am a quilt fanatic! I want more than anything to learn HOW to make them. I'm always on the lookout for loved, vintage quilts. This quilt you and the ladies made is beautiful!! And it does look perfect hanging in her house! Thanks for sharing! What a lovely quilt. i can see you've been busy. I'm new to quilting so I'll check back soon. Happy Pink Saturday. Very pretty-love the heart in the middle! That is such a pretty quilt. And it sounds like a Great Committee !! The SRE you posted for last weeks Pink Saturday is Gorgeous !! Happy Pink Saturday ! !